Going for adventurous bike trip is amazing but what if you can record it to show it to others? Or to watch it later to remember those beautiful memories again? Then it’s icing on the cake. Some of the adventurous soul are recording their road trip in the high definition and uploading it on YouTube. It is not only a fun, it is even emerging as a very lucrative business as lot of these guys is gaining popularity and earning fairly decent amount. You can do this too but for that you need to have a high quality motorcycle camera which can easily capture fast moving images. These days thousands of cameras are available in the market but they all are not relevant for you. 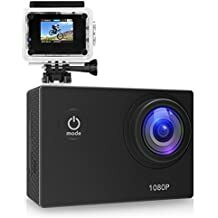 Therefore we have listed below Top 10 Best Motorcycle Helmet Cameras that will be convenient for you to record videos while going for road trip. 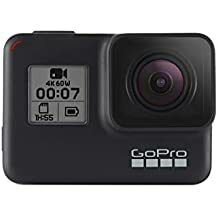 It is now possible to record super smooth video footage coupled with the HyperSmooth stabilization attribute of the GoPro HERO7 which can deliver gimbal like video even when you lack a gimbal. Your movements are predicted by the digital action camera which thereby corrects the camera shake and ushers in insanely smooth footage. Its SuperPhoto mode is similar to the scene-intelligent auto option of a much more conventional camera and automates an array of features even when you forget to do the same manually. The Hero 7 Black will thus deploy multi-frame noise reduction for capturing low-light scenes if it feels the need for doing the same. Users can adjust the level of white balance, exposure compensation, sharpness, ISO range and many more for exercising greater flexibility. Apart from JPEGs, it also becomes possible to capture raw images on the Hero 7 Black which shoots bursts of images at 30fps. Its built-in live streaming capability makes Hero 7 the perfect choice for uploading video on Facebook or YouTube. 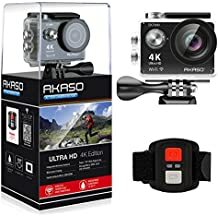 The rugged build of this action camera guarantees complete peace of mind even when you take it along on your adventure trips. The camera can be submerged 10m underwater without a housing while the optional Super Suit can help you in diving deeper for capturing the serene marine beauty. The camcorder records the 4k videos very smoothly with ultra high quality. The videos are sharper and full of life. It is highly useful for capturing pictures. It captures images at 12 MP. For taking pictures it offers you three modes, that is single photo, time lapse or burst photos. You can set time for time lapse mode between, 5 to 60 seconds and it automatically captures the pictures at the defined interval. Burst mode allows you 30 blistering images in a single frame. The camera is provided with a remote for easy shift of modes as per your choice between camera and video recorder. 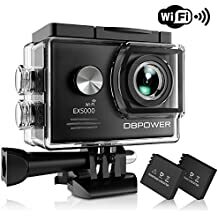 It is supported with Wi-Fi that makes it easy to transfer pictures, videos and to connect to your other devices like smart phones, TV, laptop or desktop. Wi-Fi lets you have a control over your camcorder even from a distance of 15 meters. The camcorder is attached with sony sensor. The sensor records the 4K HD quality video at the rate of 30 frames in a second. The camcorder is fast and highly powerful. Images can be clicked with a resolution of 16 MP. You can store all your videos and clicks in your camera as it supports Micro SD card upto 64 GB. Wifi connectivity ranges up to 10 meters. Wifi lets you connect and transfer the data to other devices easily. The cam is waterproof that enables you to capture your underwater recordings easily and in a very high quality. It has 2 inch wide display screen, useful for replay of your recordings. 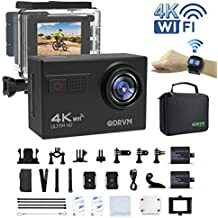 The camera is marketed with a set of accessories including bicycle and helmet mounting kit, zip ties, straps, waterproof case and a lot more useful attachments. The camera is very sleek and compact. It is manufactured with very high resolution of 1440 pixels/inch. It supports Bluetooth along with wi-Fi. Bluetooth and wi-fi makes it easy for a user to connect the camcorder to apps, devices and accessories. The recording of videos can be done at 100 frames per second. For clicking pictures burst photo and time lapse options are available. Burst photo captures 10 frames per second. The designing of the camera makes it durable and the camcorder requires no housing underwater up to the depth of 10 meters. It is packed with highly useful accessories and gives the satisfactory recordings through camera. 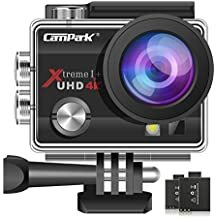 The camcorder has 14 MP HD sensor and fish eye lens of 170 degree wide ensuring the picture quality and making it very crisp and clear. It is supported by wifi, downloading a simple app can let you control your camera through your Smartphone. The camcorder is extremely light weight weighing around 58 g and very sleek in design making it highly portable. It is highly suggested for real time recordings. It is provided with extra battery allowing the user an extra time use without worrying about the power off. It supports SD card of memory upto 32 gb. The camera is not only good for the motorcycle road trip but also for the underwater recording. It is water proof and equipped with 20MP of camera which provides 4K videos at 24fps, QHD at 30fps, Full HD 1080p at 60fps. It is a Wi-Fi camera with remote control which lets you use it very conveniently. If you want to capture underwater videos then you can dive upto 98 feet to record with the camera. The camera has 2 rechargeable 1050 mAh batteries included. If you are worried about the camera memory then not to worry as it supports micro SD card of up to 64 GB. This action helmet serves all time for all the adventurous use under all circumstances. It is waterproof and records good quality video underwater up to 30 meters deep. It is safe and suitable for both kids and elders. It has kit containing 18 accessories suitable for snorkeling , biking, racing, skiing and water sports too. The camcorder is available with latest design and wrist remote control. It records slow motion videos very efficiently at 1080P. It works best for professional videographers as it has an additional option for loop video recording. It comes with highly powerful battery and excellent accessories. Can work with durability up to 98ft under water and record all the thrilling water sports. It has 2” HD display to see your images and recorded videos. 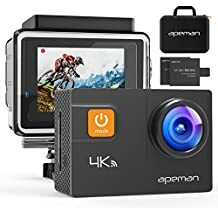 This pocket-sized camera from the house of APEMAN can be of great assistance in taking superb quality images with its professional 4K tech support. The footages recorded can be viewed easily in its 2.0-inch LCD display for one tap editing. Its newly designed waterproof case can keep your back as you engage in the most extreme form of water sports. It can capture all the serene underwater scenery even when you dive 40 meters below. 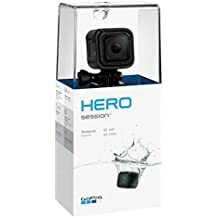 The built-in gyroscope stabilizes the recorded image thus serving as the ideal choice for undertaking water sports like diving, surfing and even swimming. You can share the recorded footages easily coupled with its built-in WiFi. All you need to do is download the supporting application in your smart device and that can empower you to exercise optimum control over the functioning of the camera on real-time basis. 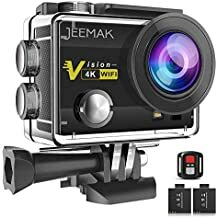 You can also opt for the USB, HDMI and AV slots for hooking up this versatile action camera with other network peripherals be it your television, projectors or even computers. A diverse range of shooting modes like Car mode, Loop recording, Timer-shoot capture modes etc. 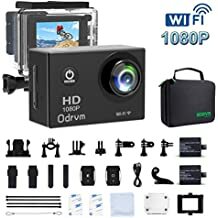 are supported by this dynamic action cam thus extending your possibilities. It captures HD quality video and amazing pictures with 12 MP. It is waterproof and can work efficiently underwater upto 100 ft deep. 170 degree wide angle lens helps to take videos with more clear and larger view of the surrounding fields.